If you’re unfamiliar with Marc Brown’s Arthur books, you may not immediately see the charm in a picture book series featuring an aardvark. But take my word for it. Arthur is wonderful. I read many an Arthur book when my children were small. I also watched countless Arthur cartoons on PBS, thankful for a respite from that insipid duo, Barney and Baby Bop. 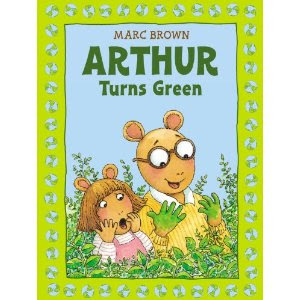 Now, to celebrate the 35th anniversary of America’s favorite aardvark, Marc Brown has written "Arthur Turns Green" ($16.99; Little, Brown), his first Arthur picture book in nearly 10 years. He’s also visiting Charlotte. He’ll be at Park Road Books, 4139 Park Road, at 4 p.m. on Tuesday, April 5. Brown is planning a Power Point presentation, he told me in a recent interview, to show kids where he lives and works and where his characters come from. He’s hoping to inspire his readers to write their own stories. He’ll also read "Arthur Turns Green," the story of Arthur’s attempts to save energy and the planet. Brown, 64, now has more than 80 Arthur books, and PBS’s "Arthur" show remains the nation’s No. 1 children’s series. It also has, in my humble opinion, the best theme song -- a reggae number by Ziggy Marley. How did Arthur begin? As a bedtime story, Brown told me. His son wanted an animal tale. An aardvark was the first animal that popped into Brown’s head. Brown’s first Arthur book, "Arthur’s Nose," features an Arthur with a long aardvarkian nose, very different from today’s character. Over the next several years, Arthur Read evolved into the earnest, bespectacled 8-year-old aardvark we love today. Funny thing is, today, Arthur hardly has a nose at all. "It’s a little like the Michael Jackson story," Brown says. Mega-bestselling author David Baldacci speaks at 7 p.m. tonight, March 31, in a free lecture at Lenior-Rhyne University in Hickory. The talk is in the P.E. Monroe Auditorium on campus. 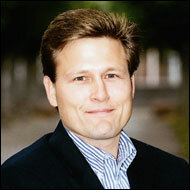 Baldacci will also sign books 5 -6 p.m. at Hickory's Patrick Beaver Memorial Library. Baldacci's newest thriller, "The Sixth Man," is set to publish April 19. His first political thriller "Absolute Power," was made into a 1997 movie starring Clint Eastwood and Gene Hackman. In June, he's departing from his thrillers to release a family drama. Called "One Summer," it's set in South Carolina. In Charlotte poet Diana Pinkney's new collection, "Green Daughters" (Lorimer Press; $14.95), we discover poems bursting with images of ocean and shore -- ships and dolphins, peeled shrimp and an island grocer, and, of course, mermaids, the green daughters of the book's title. "There is much delightful humor throughout these pages as there is heartbreaking gravity," says Cathy Smith Bowers, North Carolina's poet laureate. Pickney will read and sign books at 2 p.m. Sunday, April 3, at Park Road Books, 4139 Park Road. Davidson College English Professor Cynthia Lewis recently won second and third place in the N.C. Writers' Network's annual Rose Post Creative Nonfiction Competition. Her essay titled "That Dress, That Hat" won second place. Third place went to "Secret Sharing: Coming Out in Charleston." 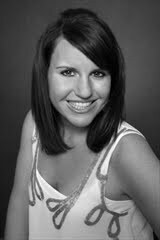 Lewis teaches Shakespeare, Renaissance literature and creative nonfiction at Davidson. Pepper Capps Hill, who lives in Rocky Point, won first place in this year's contest for an essay called "There's No Crying in a Tobacco Field." On Sunday, I wrote a piece about how some authors are finding success with self-publishing, thanks to technology that makes it easy, especially with e-books, to publish and distribute. This self-publishing revolution has some folks predicting the demise of traditional publishing. But not so fast. The New York Times reports that self-publishing superstar Amanda Hocking has decided to give traditional publishing a spin. She has sold a four-book series to St. Martin's Press. Hocking, a 26-year-old from Minnesota, has made about $2 million selling her young-adult novels as e-books. She told the Times she was tired of hearing from readers who couldn't find her books in stores and tired of spending time "formatting her books, designing covers and hiring freelance editors — all tasks that fall to the self-publishing author." Got extra books? Friends of the Library wants them. If you're ready to part with some of those books you've accumulated over the years, the Charlotte-Mecklenburg Friends of the Library could use them. --9 a.m.-3 p.m. Saturday, April 2, in the upper area of Park Road Shopping Center's parking lot. Look for the big trailer. For every 10 books you donate this day, you'll get $1 off any purchase at Park Road Books on this donation day or Sunday, April 3. -- 10 a.m.-4 p.m. Wednesday, April 20, in the Mint Hill Library parking lot. location at Quail Corners Shopping Center. "Banktown: The Rise and Struggles of Charlotte's Big Banks" has been named a finalist in ForeWord Review's 2010 Book of the Year awards. Written by Charlotte Observer banking reporter Rick Rothacker and published by Winston-Salem's John F. Blair, "Banktown" describes how the nation's financial crisis played out at Charlotte's biggest banks, Bank of America and Wachovia. ForeWord's Book of the Year awards honor books from small and independent publishers. "Banktown" is among 13 finalists in the business and economics category. Winners will be announced in June. After graduating from Davidson College with an English degree in 2005, Gwendolyn Heasley earned a master's in journalism and landed in New York with big plans for an exciting journalism career. Manhattanite Corrinne Corcoran is shopping at Barney's when her mother messages her to come home for a family meeting. Turns out Dad has lots his job -- and the family's savings. While he heads to Dubai to take a lower-paying job, the rest of the family relocates to a small Texas town to live with grandparents. The book, says Relate magazine, is "one good thing to come out of the last few years of economic downturn." Heasley's now at work on a second novel. She'll sign copies of "Where I Belong" at 6 p.m. Tuesday, March 15, at Park Road Books, 4139 Park Road. Regina, you've won "Journal of a UFO Investigator"
Yes, Regina, the odds were good in this book giveaway. You've won "Journal of a UFO Investigator," the debut novel by David Halperin. Email me your mailing address, and I'll send it to you. Thanks for reading! Asheville's Sarah Addison Allen. Her New York Times bestselling novels include "The Girl Who Chased the Moon" and "Garden Spells." She has new book, "The Peach Keepers." Raleigh's Angela Davis-Gardner, author of "Plum Wine." She also has a new novel, "Butterfly's Child." Davis-Gardner, who was born in Charlotte, is a professor emerita at N.C. State University. Chapel Hill's Minrose Gwin. Her 2010 debut novel, "The Queen of Palmyra," won strong reviews. A UNC Chapel Hill English professor, she also has a memoir, "Snow." The three authors will speak at a dinner, 7 p.m. on Tuesday, March 14, and at a luncheon on Wednesday, March 15. A luncheon reception begins at 11:30 a.m. Tickets are $55 for the dinner , $40 for the luncheon. For tickets: 704-688-2708 or email fol@queens.edu. "Journal of a UFO Investigator" author visits Charlotte. Win a copy of his book. When teenager Danny Shapiro forms a club called The UFO Investigators, strange things begin happening. 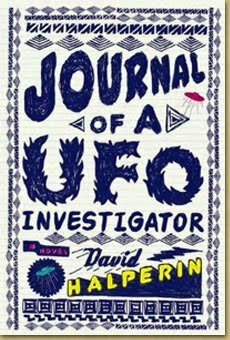 That's the intriguing premise of "Journal of a UFO Investigator," the debut novel from David Halperin, a retired UNC Chapel Hill religion professor. Here's an interesting Q&A with the author from Raleigh's News & Observer. Halperin will sign books at 2 p.m. Saturday, March 12, at Park Road Books, 4139 Park Road. And I'm giving away a copy. Enter to win by posting a comment on this blog with your name or some way to identify you -- not just "anonymous." Then, make sure to check back on Thursday, March 10, when I'll randomly select a winner. Tomorrow is National Grammar Day. Watch your apostrophes. I don't know who declared Friday, March 4, National Grammar Day, but I kind of like it. I'm one of those people who cringe at the misplaced apostrophe, the use of "affect" for "effect" and other grammatical malpractice. In honor of the day, let's all check our spelling and hang our commas by clauses with care. Also, check out these 10 grammar myths. 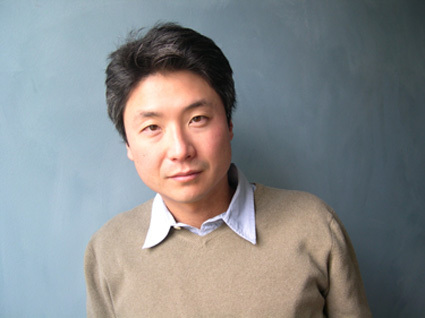 Chang-rae Lee, one of The New Yorker's 20 best writers under 40, will sign copies of his latest novel, "The Surrendered," at Park Road Books, 4139 Park Road, 7 p.m. Tuesday, March 8. Now in paperback, "The Surrendered" tells the story of three people whose lives collide at a Korean orphanage following the Korean War. The New York Times calls the novel "a gripping and fiercely imagined work." Lee, whose books include "A Gesture Life" and "Aloft," won the Hemingway Foundation /PEN Award for First Fiction for "Native Speaker." He teaches creative writing at Princeton University.